Death Valley has so many interesting geologic features it's hard to know where to start and what to include. It would be impossible to cover all of the features of the valley comprehensively in this article, so instead I've selected a few of what I believe are the more interesting features. Starting at the lowest point in the park (and North America), we'll work our way up. Along the journey, we'll examine salt deposits, sand dunes, alluvial fans, the unique Ubehebe Crater, the famed Racetrack Playa, and finally the larger forces that have created the massive peaks and the valley itself. From a distance, the floor of Death Valley seems quite uniform and flat. The salt pan, one of the world's largest, makes up a large portion of the valley floor. It is comprised of residue left over from the evaporation of water trapped in the valley. Some of these deposits have formed recently, but most are leftovers from the ancient Lake Manly. These deposits are nearly 9,000 feet deep! 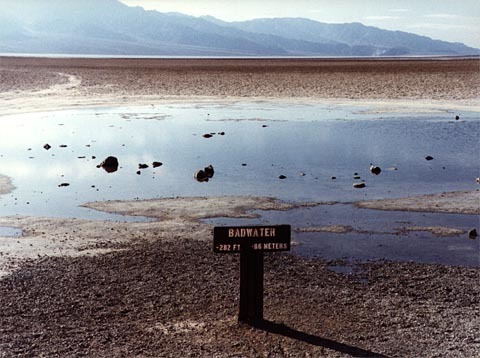 At the lowest point, 282 feet below sea level, you'll find Badwater, a nasty salty pond, lifeless except for microscopic plant life. Surrounding Badwater, other salt deposits, such as the Devil's Golf Course, have rough features where brief rainstorms have carved through the existing salt deposits. Badwater, the lowest point in North America. Click on the photo to view larger version. Photo by Benjamin Mendelsohn. Allen Glazner explains how the salt pan was formed and what it is made up of. 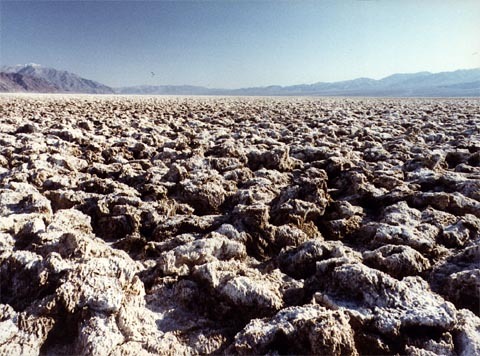 The Devil's Golf Course. Click on the photo to view larger version. Photo by Benjamin Mendelsohn. Table salt is what most people think of when they think of salt, and sodium chloride (NaCl) can be found in the salt pan. There are also other compounds with residues rich in sulfates and carbonates. Each of these compounds has a different solubility and this affects the order in which each is deposited during evaporation. Carbonates are deposited first, followed by sulfates, and finally by the most soluble compound, sodium chloride. Some of these compounds are useful and valuable. Borate minerals (such as ulexite & borax) are used in the manufacture of a variety of products, including soaps, pharmaceuticals, herbicides, and even rocket fuel. Part of Death Valley's history includes Eagle Borax Works--a borax mine founded in 1881. The famed 20-mule teams were charged with the task of hauling borax 165 miles to the railhead at Mojave, California. While most mining in Death Valley proper has been curtailed, borates continue to be mined throughout the region. A 20-mule team hauling borax out of the valley. Photo provided by the National Park Service.